Celebrating 25 Years of Home Building! Countless details go into the building of a home, many of which a potential homeowner may not be aware of. That's where Keener Homes, Inc., comes in. We are a custom home builder that homeowners can rely on to help them through the building process. Having built homes since 1991, we have established a strong reputation for value, craftsmanship, and integrity. We work with our customers to help them make decisions in building their home, keeping in mind their styles, expectations and diverse backgrounds. We have happy customers in many areas, including Loudon County, Oak Ridge, Knoxville, Rarity Bay, Kahite, WindRiver, Thunder Pointe, Lighthouse Pointe, and Tellico Village. Keener Homes is a Rarity Bay custom home builder and Rarity Approved Builder. 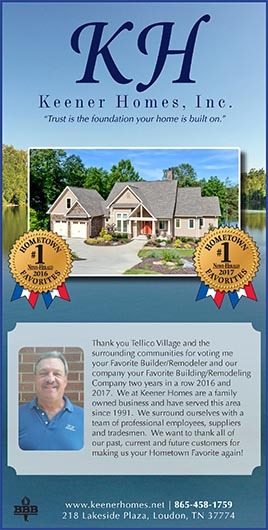 We are a Tellico Village Preferred Home Builder. © Keener Homes, Inc. All Rights Reserved.